PCH, War Wagon Edition: Faun-Kraka or Studebaker Weasel? Well, it looks like yesterdays Heap-O-Parts GM Convertible Challenge Poll has come out so close as to be a virtual tie. Today we're going to shift gears and go with a couple vehicles that- if running- could be just the thing for your post-apocalyptic survivalist compound in the woods. Yes, it's War Wagon Hell today! 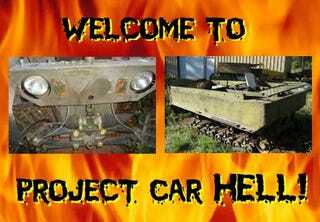 Project Car Hell, GM Convertible Edition: Cutlass or Grand Prix? So the rotting, corrupt edifice that was 21st-century civilization has finally collapsed, and you and your bedraggled followers- I mean, "soldiers"- are holed up in a mud-walled compound stocked with freeze-dried rations and ammo. As warlord, you'll need a vehicle that impresses your subjects, yet is practical for a roadless environment. How about this Faun-Kraka, the ad for which may be the winner of the Jalopnik Least Informative Car Listing Evah Award? You get no price, no details on condition, no nothing other than a photograph of what appears to be part of the vehicle's nose and front suspension. We're going to assume that it doesn't run and needs a bunch of damn-near-impossible-to-find parts, and that the seller will be a very difficult negotiator. But still, don't you want a go-anywhere vehicle that folds up for parachute dropping? Here's a machine-translated rendering of a German Kraka website that will almost fill you in; Faun-Kraka experts, feel free to 'splain more to us about this fine machine. But hey, maybe you feel that a post-apoc strongman should be surrounded by fierce German Shepherds, not fierce German vehicles. For you, we have this Studebaker Weasel, which drops a bunch of weight on both sides of the cool/hellish scale by having tracks! Yes sir, your soldiers will snap to attention when they hear the unmistakable sound of your tracked vehicle approaching through the woods. Technically, this Stude was known as the M29 back in World War Two, but if it's built by Studebaker we think you should proclaim it with pride, dammit! This one needs quite a bit of work (the seller says it's "nothing complicated that can not be done with a little knowledge or beer"), but it comes with some spare NOS treads. The original Studebaker engine has been replaced with a Ford six (boo!) and an automatic transmission (BOOOO!) but once you've got this thing in a billion pieces on your garage floor you'll be in the mood dropping in a blown Avanti 289 and 4-speed; hey, if you're in Hell already you won't even notice a 10° temperature increase.